The 2007-W $10 Dolley Madison First Spouse Gold Uncirculated Coin marked the fourth strike in a series created to honor the spouses of the former Presidents of the United States. Dolley was married to James Madison, the fourth President of the country. She is probably best remembered as playing a role in saving important papers and art from the White House before it was burned by British troops in the War of 1812. Each First Spouse Gold Coin is struck from 1/2 ounce of 24-karat gold to either proof or uncirculated condition. The coins are issued on approximately the same schedule as the US Mint’s circulating Presidential $1 Coins are issued. 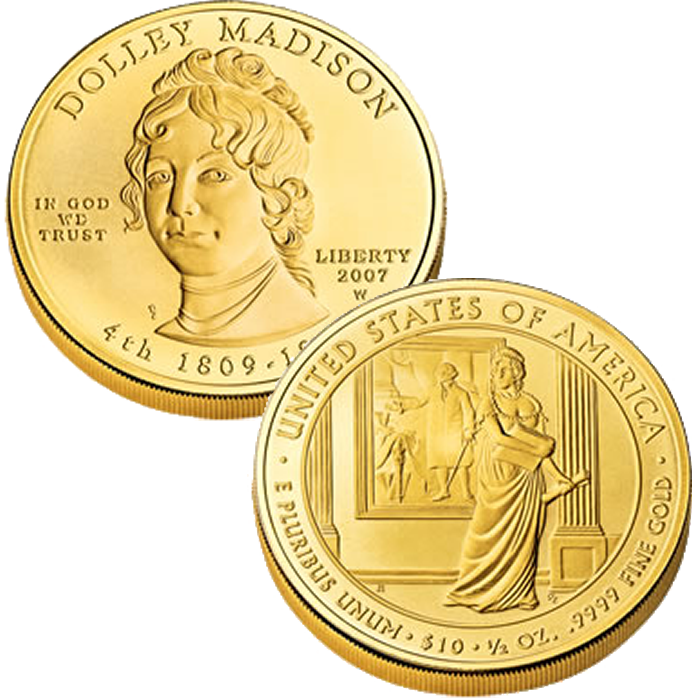 The US Mint released the Dolley Madison coins on November 19, 2007. 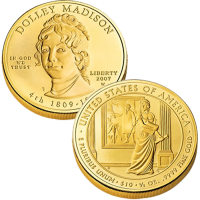 Initial price on the Dolley Madison Proof Coin was $509.95. Don Everhart designed and sculpted the portrait of Dolley Madison found on the obverse (heads side) of the coin. The reverse (tails side) shows Dolley Madison in her heroic act of saving important cabinet papers and a painting of George Washington before British troops burned the White House. It was designed by Joel Iskowitz and sculpted by Don Everhart.